Today I have a special treat for you. Brad from Cleveland Food and Brews Reviews decided he wanted to share his thoughts on a beer he recently drank. No, it's not a beer from Drew Carey's brewery! Stop asking stupid questions that I'm sure Brad is sick of hearing by now. 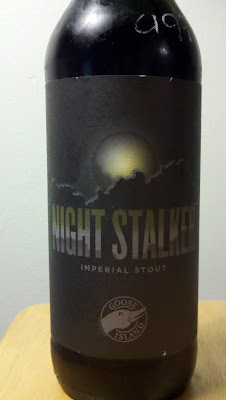 Instead, Brad picked a Goose Island beer that I have only seen in pictures. I have had a few beers from that brewery thanks to a little help from my friends, but they are not available in South Florida otherwise. And I absolutely loved the ones I did try: Oh, Sofie and Matilda, I... never mind, I'm getting off track. Cleveland Food and Brews Reviews takes a look at local restaurants and has a separate area dedicated to talking about beers from around Ohio, the rest of the country and the world. Check out the site if you're going to be dining in Cleveland and for a fresh look at some great beers. Brewmasters Notes: A heavily-hopped imperial stout, Night Stalker is a heavyweight of a beer. 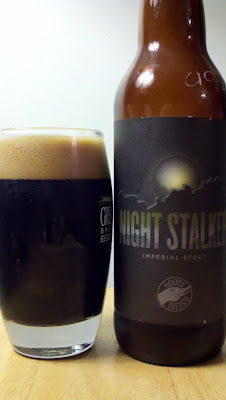 It delivers a formidable punch of hops and rich roasted malt notes to the nose in a silky body that's as dark as night. My review: When I poured this beer the color was nearly black as coal with a slight brown foamy head. The smell alone was intoxicating. I smelled chocolate, coffee, malt and the 11.7% ABV was noticeable but not at all off-putting. After my first sip I uttered the words "Holy Crap this is soooo Good." Right away my taste-buds picked up on the dark roasted coffee flavors! I also tasted some very dark chocolate, toffee, and much to my liking... HOPS! I couldn't believe this was a "hoppy" black imperial stout. When I researched further I realized this beer was rated at 60IBU. For a stout this dark I thought that was amazing! The ABV's were noticeable while drinking, but not at all overpowering, although if you have two of these back to back you better watch out for those ABV's! Overall, the hops, malts, coffee, and chocolate combination totally worked for me. I would buy this beer again in a heartbeat regardless of its $10 price tag for a 22oz bottle!! 11.7% ABV! I don't think I make much sense now. Thanks to Brad for sharing this ^_^! People do joke with the words Stalk and Stalker, which is exactly what they are saying to you. You are so sweet though. BTW, you can stalk me anytime. This beer is a stalker because you don't know it is there. By that I mean the 11.7%ABV. The beer is dark and sinister like Rob said, and it creeps up on you without you knowing. The flavor is so good you don't know what has hit you until you've finished the bottle. At $10 for a 22oz bottle that is the price of a good 6-pack of craftbeer...but this was worth every penny! Goose Island named this brew perfectly...now if they couldn't only get their website ABV and the bottles label ABV to match up! Thanks again for he opportunity for the guest review! Thanks Brad for telling a bit more! I really love the name, even tho it sneaks up on you haha.